What is S35 VN Steel and How Does It Compare? 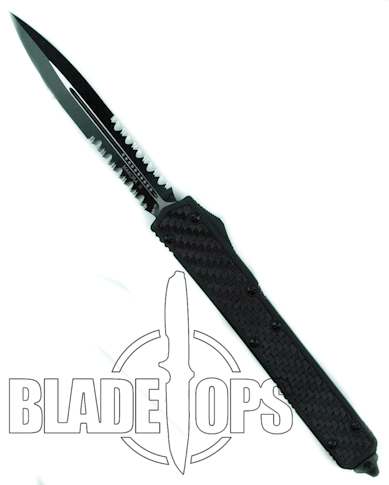 NOTE: We have a newer page concerning CPM-S35VN that goes into much more detail. To read the newest page, see here. Recently, a few knife manufacturing companies began to produce knives with S35 VN steel. Specifically, Microtech began producing many of their new knives as well as some old reliable knives with the S35-VN steel blades. The Makora II OTF knives that just came off the production line have this S35-VN stainless steel. CPM S35 VN is a martensitic (see Note) stainless steel that is supposed to give the best in toughness, wear resistance, and corrosion resistance. It is actually a variation of CPM S30-V with a different chemistry. The chemistry change makes it not only easier to grind but makes it tougher overall. What is the chemistry change? S35-VN has niobium added to the mix. The added niobium forms niobium carbides along with the vanadium and chromium carbides that is in the S30-V mix. Some of the vanadium carbides from the S30V mix get replaced by niobium carbides and the new alloy is about 15 to 20% tougher than S30V. And, there is no significant reduction in the wear resistance. My guess? Look to see a whole lot of S35-VN in knives over the next few years. Author adminPosted on May 4, 2011 October 27, 2014 Categories microtech knivesTags s35, s35-vn, s35vnLeave a comment on What is S35 VN Steel and How Does It Compare?